The venue has moved from the Hotel School this month. We shall be 27dinnering at Relish, the original venue. It's a less formal venue, more conducive to moving around and socializing. As usual, it's pay-as-you-go dining. No set menu or obligations. There's no formal seatng this time, so expect to go for tappas and pizza instead of the usual 3-courses. Sponsors this time are Cerebra (orkanizing), Symantec (projector and sound), Lingham Capital (desserts), Zoopy (3video iPods e squared fashion (funky tshirt giveaway), Ikineo (speaker's food), Stormhoek (some vino) and Charley's Bakery (take-home goodies). 27dinner Jozi is at a new venue: M&A Cafe in Sandton, Corner West & Maude and Str (Map). Thanks to Kwamz Mdaka from Granadil Media for helping to organise this stylish new venue at the last minute. Symantec has offered sponsorship for the projector, so hopefully this will be the first 27dinner Jozi that we don't run at a loss! Stormhoek will be providing the vino as always. The first 27dinner in Durban is at Ciao Italia Restaurant - Westville. Marc Forrest is the Durbs organiser. I'm flying there to checkitout and am looking forward to a lekker jol! It's on at the Primi Piatti Studio at the Zone, Rosebank. We're looking to kick off at 18:00 - a bit earlier than usual because it's on a Sunday. Really exciting speakers for night are Colin Daniels (online strategy manager The Times); Erik Hersman (the White African); and Vinny Lingham (top young IT entrepreneur in Africa & endeavor entrepreneur for 2006).Â Vinny is going to be making a very exciting announcement on the night. Even more exciting is the list of attendees who are coming - some seriously kickass media and geek-folk. Â Skyrove will also auction two wifi hotspots away, and give the money raised to iCommons. Stormhoek will, as always provide complimentary social lube in the form of Sauvignon Blanc, Pinotage, Pinot Grigio, and Rose goodness. When lots of cool stuff has already been said about an event, is it worthwhile to add yet another blog post to the mix? When I first started blogging, I would be eager to write about something, but then I'd see it written on another SA blog and I would get demotivated. I was looking for the scoop in every case... So I ended up not posting very often at all. Part of what's interesting when analysing blog posting volumes is how the number of posts increase around major news events. So anyway, my point: I took a lovely hike last week. At various junctures there were sign posts marking the way, held up by a pile of stones. Everyone that passes these sign-posts should add a stone to the pile because the winds and rain are constantly rolling other's stones away. It's a seemingly trivial act, but it's a way to help guide other hikers and show them that they're on the right path. To the people who put their name down on the wiki and actually came! 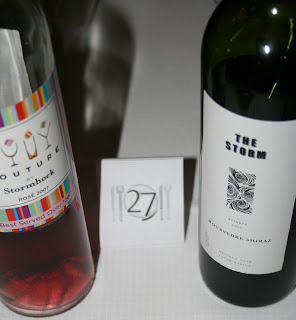 To Stormhoek for providing the wine and organising the venue. To my business partners at Cerebra, Mike in particular, for continued support of the 27-dinner project. To Henk, who donated 3 Skyrove wifi hotspot kits. We auctioned them off at the dinner to raise funds for iCommons. And also to the angel bidders who bought them: Nikki Friedman, Jacques Marneweck, and Ian Gilfillan. To the speakers: Ian Gilfillan (Deep, soulful and technologically advanced! ), Glen Verran (Passionate voice of the SA podcasting movement) and Mike Scott (Hilarious, profound and inspiring cartoonist). I know that lots of good networking and socialising happened. I, for one, am chuffed at the result... Although, to be honest, I would have loved to have seen more racially diverse representation there, especially on Freedom Day.